Go for a bath chair that requires minimal assemble and that does not need any tools for assembly. However, you may need to strength to push certain parts into position. If you are buying a bath chair for an elderly family member, you may want one with comes with pre-assembled items. Some shower chairs can be adjusted or dismantled for easy storage or movement. You may want one of these chairs if you usually travel around. Choose a bath chair or bench that will fit in your shower or bathtub. Remember to factor in additional space at the sides. If you are looking for a bathtub to use as a short-term solution, perhaps as you recover from injury, durability shouldn’t be a big concern. On the other hand, if you want a product that will last, go for those made of rust-free aluminum frames and sturdy plastic seating. Check whether the manufacturer offers a lifetime guarantee for the product as this is usually an indication that the chair is built to last. Apart from the basic structure, check for features such as high-visibility colors, padding, drainage holds, safety belts, nonslip feet, nonslip seats, and handles. Finally, find out how supportive the bath chair you want to buy is. Consider the weight of the person that will be using the chair to know what capacity you should be looking for. Read on for an overview of the best bath chair for disabled adults. The Drive Medical bath chair transfer bench is a budget friendly option made from blow-molded plastic that makes it stable and durable. The chair has a reversible height, which means it can fit in a variety of bathtubs and can be used by people of all height. The chair has extra-strong suction cups on the legs for additional stability. This is a low-cost bath tub that does not require any tools to assemble. The adjustable height of the chair makes it suitable for use by people of different heights. 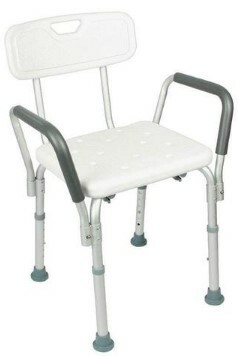 The NOVA Medical shower chair for the elderly weighs only 7lbs. The deluxe bath seat is a great option to carry when you are traveling as it does not require any tools to assemble. The chair’s back and set are made from heavy-duty plastic while a rust-proof aluminum frame holds them in place. The arms are padded for comfort and the anti-skid legs prevent slipping. 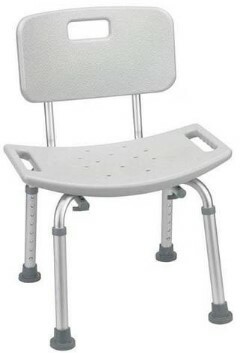 This shower chair has an adjustable seat and legs and, hence, can be used by people of all sizes. We love this bath chair because its assembly does not require any tools. The chair has a sturdy design and takes minimal space. However, the bath chair may start bending if it’s regularly used by adults that weigh over 200lbs. The Vive bath chair has an extra-wide seat and adjustable height. The chair’s is stable thanks to the non-slip legs and its padded handles make it comfortable. This chair fits most showers and bath, is lightweight and can hold up to 300lbs. We love the Vive bath chair because of its adjustable height that makes it fit in almost any tub or shower. The chair does not require any tools to assemble and its contoured seat has drainage holes that reduce slipping. The Vive shower chair has a rust-resistant aluminum frame and sturdy plastic supports a comfortable backrest. The AquaSense bath and shower seat for disabled adults has built-in handles, adjustable legs with nonslip rubber tips, drainage holes for safety and comfort, and a slip-resistant seat. The chair is made of an aluminum frame and, therefore, is ruts-resistant and lightweight. The compact size of the chair makes it suitable for use in almost any bathtub. We love this chair because it is lightweight, easy to assemble, and corrosion-resistant. However, its legs can be a little unstable for the elderly who are heavy. This bath seat features an aluminum frame that can hold up to 300lbs. The chair has a contoured polyethylene seat that has anti-bacterial properties, is comfortable and durable. There are also skid-proof rubber tips that ensure weight is distributed evenly for greater safety. The EVA Medical Adjustable Shower Chair has built-in handles for safety and comfort as well as drainage holes that reduce the risk of slipping. You can customize the seat with an optional back support and height-adjustable legs. 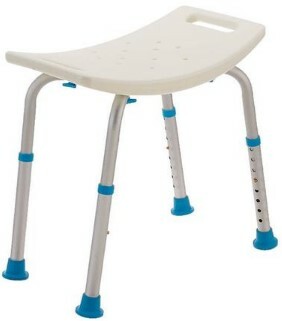 This hygienic and comfortable bath chair for disabled adults is easy to assemble. We love the rubber leg tips, seat, and supportive handles. However, the chair legs can, over time, be unstable. The Platinum Health transfer bench and bath chair for elderly adults will make it easy and safe for you to move in the tub or shower. The bath seat is padded on the arm supports, seat and back. This whose chair is slip-resistant and easy to clean. The bright blue design of the chair makes it easy to for visually impaired people to locate it. Moreover, the pivoting armrests and swiveling seat ensure easier access for people with mobility issues. The height of this bath seat can be adjusted and, hence, you can use it in almost any bath tub. The Platinum Health transfer bench is designed by frontline healthcare workers and is, therefore, comfortable and supportive. The chair is durable, corrosion-resistant, and easy to clean. 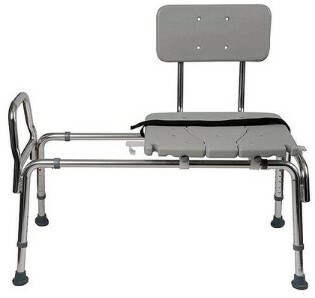 The Duro-Med sliding transfer bench is recommended for walker or wheelchair users. 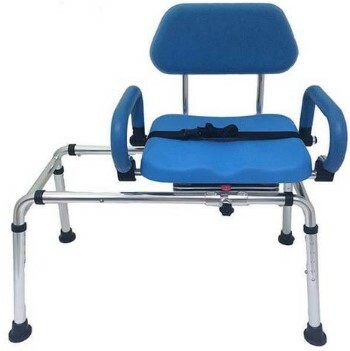 The bath chair also helps to reduce back strain for caretaker. The shower chair has a textured plastic seat and backrest that provide peace of mind as they reduce slipping. There is a removable section of the seat that allows you to wash sensitive parts of your body without moving. The Duro-Med bench is lightweight, weighing only 14.5lbs. The bath chair for disabled adults can support weights of up to 400lbs. The Duro-Med bench does not require any tools for assemble. The non-slip chair has a seatbelt for extra security, and adjustable slip-resistant legs. However, over time, the chair’s cutout center can pop out of place. Disabled adults and the elderly may find it difficult to do everyday activities such as showering. Our top recommendation for the best shower chair is the model by Vive. The chair has nonslip rubber feet and a sturdy base to sit or lean as you take a bath. You can use the chair to support yourself whether you prefer bathing while seated or standing. 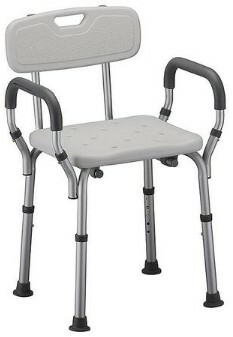 The chair is also a great mobility aid for getting in and out of the shower without falling. Assembling the bath chair is easy, so you can carry it wherever you travel.